It's getting to be that time of year when we all want fresh ice to be readily available, especially on really warm days. Here is Part I of our Ice Maker Troubleshooting Points that address the most commonly reported refrigerator ice maker repair issues. Complaint: There's no ice in my Ice Maker- it's not making ice! First, make sure the ice maker is actually turned on. There is usually a wire along the right side of the unit, and it should be in the lowest position possible. When the wire is in the raised position, the ice maker is not engaged, and it will not make any ice. 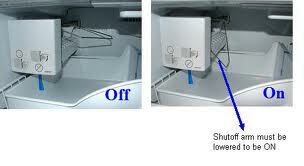 Various refrigerator ice maker units will allow you to lower the wire to turn the unit on. If the ice maker wire appears to be in the correct position, then the next step is to check the freezer temperature. The internal temperature of the freezer needs to be between 0 to 8F degrees. If the temp gets above 10 to 12F degrees, the ice maker cannot make ice. For newly installed ice makers, the unit may not work properly until the ice mold temperature has dropped to 15F – 16F degrees. It can take up to 24 hours for a new ice maker to start working initially. Have you just installed a new water line to the refrigerator? 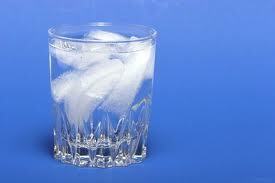 It will be about 1 1/2 hours before the ice maker begins to make ice. Something else to be aware of is that a newly-installed water line may have air in the line. It will sometimes take a few cycles of making ice for the line to clear of air. Another checkpoint is to make sure that there is water flowing to the ice maker, and that the household water supply is turned on. It's also a good idea to check the water tube to see if there are any "kinks" in it, or if there are any frozen areas in the tubing, too. Next, check to make sure the copper water supply line to the unit is turned on under the sink, or coming in from the basement. Sometimes, the water inlet valve can go bad. It's always best to call your appliance repairman to schedule a service call, if you suspect this is the problem. Also, if there is water in the ice maker unit, but it’s not freezing, you can use a freezer thermometer to verify that the temperature is cold enough for it to freeze - again, between 0 - 8F degrees. More Ice Maker Troubleshooting Tips to come in Part II - Coming Soon!